Disney and CBS Can't Keep Up with Comcast! Despite a mixed earnings release on Jul. 22, shares of Comcast rose along with the broader market. Is this a sign that the business still has room or would Disney or CBS make for better long-term prospects? Before the market opened on July 22, Comcast (NASDAQ:CMCSA), the world's largest cable operator, reported revenue and earnings for the second quarter of its 2014 fiscal year. In spite of missing on the top line, management's announcement that earnings handily outperformed what analysts anticipated sent shares of the media conglomerate up almost 2% to close at $54.63. With Comcast's shares trading less than 2% below their 52-week high, should the Foolish investor consider cashing in and buying into one of the firm's rivals like The Walt Disney Company (NYSE:DIS) or CBS Corporation (NYSE:CBS), or does the business have the muster to soar higher? For the quarter, Comcast reported revenue of $16.84 billion. Although this represents a 3.5% gain compared to the $16.27 billion management reported the same quarter last year, the company's results came in shy of the $16.95 billion Mr. Market wanted to see. According to Comcast's earnings release, this lackluster revenue growth stemmed from a 15% drop in sales in its Filmed Entertainment segment, which saw its top line decline from $1.39 billion to $1.18 billion. While management failed to deliver on revenue growth, they did provide some positive news on the earnings front. For the quarter, Comcast reported earnings per share of $0.76. In addition to coming in 17% above the $0.65 management reported last year, the business blew past the $0.72 analysts expected. On top of benefiting from higher revenue, Comcast experienced a reduction in costs, led by a drop in its programming and production expenses from 30.5% of sales to 28.9%. How does Comcast measure up against Disney and CBS? 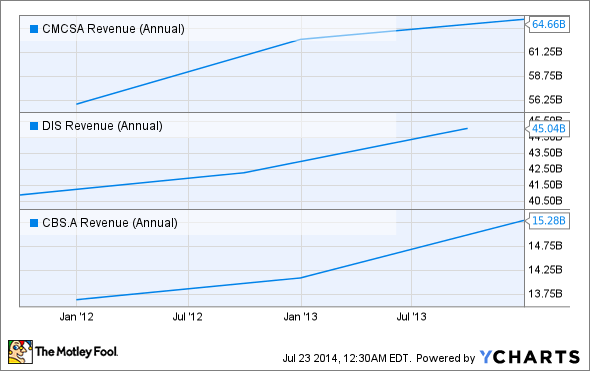 The past three years have been relatively impressive for Comcast. Between 2011 and 2013, the cable network provider saw revenue climb 16% from $55.8 billion to $64.7 billion. The biggest contributor to this growth has been Comcast's Cable Communications segment, which reported a 12% jump in sales from $37.2 billion to $41.8 billion, making up more than half of the company's consolidated sales increase. Over the same three-year period, rival Disney saw revenue inch up just 10% from $40.9 billion to $45 billion. Unlike Comcast, whose largest segment was its largest contributor to sales growth, Disney's largest contributor was its Parks and Resorts segment, which grew its top line by 19% from $11.8 billion to $14.1 billion. In fact, this segment, which is the company's second largest, made up 55% of the overall growth in the business. In contrast, Comcast's Theme Parks segment's growth accounted for less than 3% of the business's top line growth over this time frame. Although still not as impressive as Comcast, CBS's top line results came in stronger than Disney's. Over the past three years, CBS saw its revenue climb 12% from $13.6 billion to $15.3 billion. In its 2013 annual report, the company claims that the largest contributor to its sales growth over this period was its Entertainment segment. Between 2011 and 2013, Entertainment saw revenue shoot up 16% from $7.5 billion to $8.6 billion, making up 72% of CBS's sales growth. 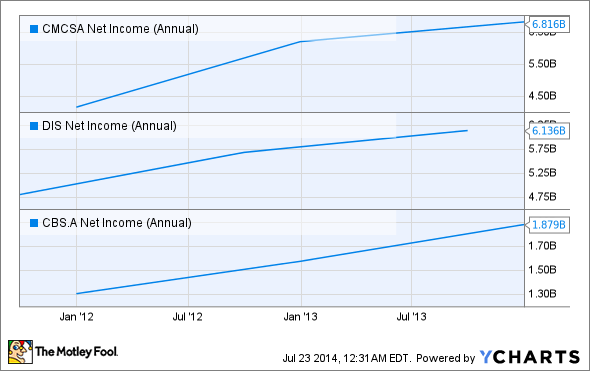 From a profit standpoint, Comcast continued to outperform its peers. Because of higher revenue growth, combined with lower costs in relation to sales (primarily from its cost of revenue and selling, general and administrative expenses), the company's bottom line shot up 64% from $4.2 billion to $6.8 billion. CBS's net income rose a more modest, but still impressive, 44% from $1.3 billion to $1.9 billion, while Disney brought up the rear with a 28% jump in profits from $4.8 billion to $6.1 billion. Right now, Comcast appears to be going through a bit of a slow time as its Filmed Entertainment segment lags. However, the company has an impressive history of strong growth in regards to both sales and profits, especially compared to Disney and CBS, which should incite encouragement in the long-term investor. More likely than not, the increase in earnings per share probably registered as the real story for the business, with Mr. Market paying little heed to revenue because of Comcast's history of long-term growth and the fact that its top line miss was so small (less than 1% from what analysts anticipated).